New research shows how the viscosity of organic particles affects the mixing state of soot and alters its warming or cooling potential. The 2010 Carbonaceous Aerosol and Radiative Effects Study (CARES) explored the evolution of atmospheric particles, or aerosols, as they traveled through a rural/urban air transport region in central California. 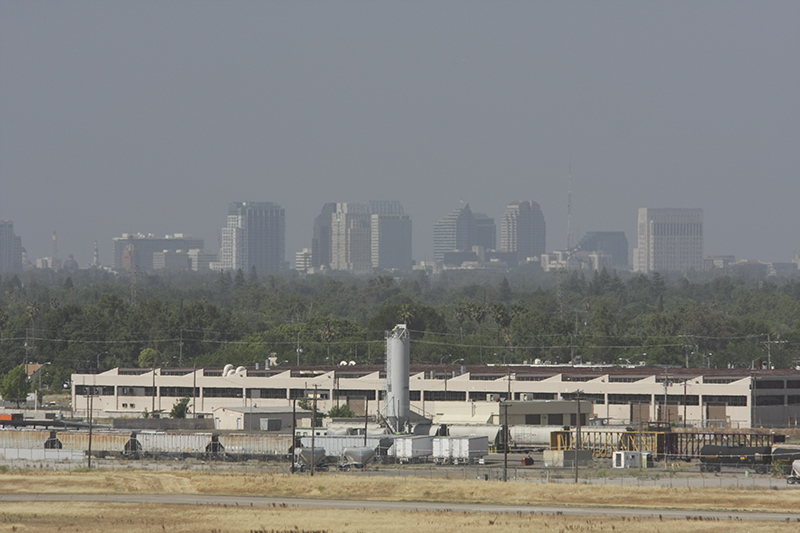 Haze that obscured the Sacramento skyline provided more aerosols for researchers to study. Image courtesy of the U.S. Department of Energy Atmospheric Radiation Measurement (ARM) user facility. In the atmosphere, individual soot particles emitted from human activities often encounter and combine with organic material, forming soot-containing particles. A research team led by scientists from the U.S. Department of Energy's (DOE) Pacific Northwest National Laboratory and Michigan Technological University established a link between the viscosity of the organic material and its distribution within the soot-containing particle. This mixing configuration is important because it alters the particles' ability to absorb and scatter solar radiation. Sponsors: This research was funded by the U.S. Department of Energy Atmospheric System Research (ASR) Program under Contract DE-SC0010019 at Michigan Technological University, Contract DE-AC06-76RLO 1830 at PNNL, and grant# F265 to M. Dubey at Los Alamos National Laboratory (LANL). User Facilities: Funding for data collection was provided by the Atmospheric Radiation Measurement (ARM) Program sponsored by the U.S. Department of Energy, Office of Biological and Environmental Research. Reference: N. Sharma, S. China, J. Bhandari, K. Gorkowski, M. Dubey, R.A. Zaveri, and C. Mazzoleni, (2018). "Physical Properties of Aerosol Internally Mixed With Soot Particles in a Biogenically Dominated Environment in California." Geophysical Research Letters 45(20), 11,473-11,482. [DOI: 10.1029/2018GL079404].